Senate Majority Leader Harry Reid has high hopes that the finished bill will be handed off to the President by Christmas. Other Dems aren't so sure. Enter Bill Clinton, saying "the perfect is the enemy of the good." But is the bill good? Mr. Clinton spoke to a closed-door meeting of Senate Democrats as party leaders were struggling to contain a growing number of conflicting demands and ultimatums from senators. "It's not important to be perfect here. 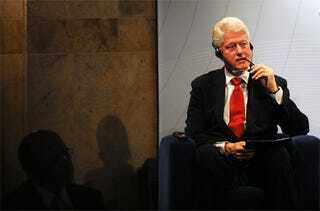 It's important to act, to move, to start the ball rolling," Mr. Clinton said afterward. "And whatever they can get the votes for, I'm going to support." Which, at this moment in time, includes the Stupak-Pitts amendment. Has Congress become like an episode of Mad Men? The Stupak Amendment slams women back to a time of stenographs and unsafe abortions. It represents an unprecedented and unacceptable restriction on women's ability to access the full range of reproductive health services to which they are lawfully entitled. It is truly disappointing to see women's reproductive rights on the table as a bargaining chip for health care reform. It is equally disappointing that the United States Council of Catholic Bishops (USCCB) was let in the room to bargain, then ended up writing the law. [T]he U.S. Conference of Catholic Bishops and its allies in the House distorted the facts about the health reform proposal by claiming that the proposed system would have used federal dollars to cover abortion care. They're wrong. The original House bill included a compromise that required all plans to separate public and private dollars in the new system - ensuring that no tax dollars would ever cover abortion services. In fact, the bishops should be familiar with this arrangement because it reflects the same principle of separation that guides their financial interaction with the federal government. The bishops have a long history of almost unlimited access to enormous quantities of federal funding. When it comes to funding for Catholic schools and hospitals or programs run by Catholic Charities, they accept federal funding with open arms. The bishops never question their own ability to lawfully manage funds from separate sources to ensure that tax dollars don't finance religious practices. Yet they reject the idea that others could do the same. This is the very definition of hypocrisy. However, there may be some small hope here - Majority Whip James Clyburn mentions that the Stupak-Pitts amendment may not be as influential as it seems. He claims the bill provided ten needed votes, not the 40 that were estimated. If that is the case, it could change the dynamic of the debate and give progressives a stronger hand than many thought they had. It's easier to reverse a provision that only wins 10 votes — and angers a good chunk of the Democratic caucus — than one that makes or breaks the bill. In other words, it's easier to win four or six votes than it is to grab 38.